The Pillsbury Doughboy will be sure to knead the team into a cohesive unit. 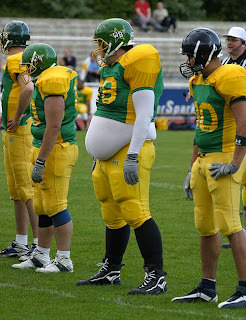 They knew little Jimmy had an eating problem when the football went missing mid-game. Clearly a case of dunlap disease...his belly done lapped over the top of his pants. Way to go Margo. You be hangin' with the Dufus. Uh, keep your germs to yourself. Skye: Her answer made me laugh out loud! Hahaha. Thanks John and way to go Margo. That sounds like a southerner speaking though. Where'd you come up with that? Don: If that guy can make it to the NFL, he'll be rolling in dough! I'm still laughing out loud at Margo's caption! Quirks: It was a good crop of captions this week, for sure. Thank you, thank you, thank you! Wow, I should try captioning under the influence more often. Dunlap Disease is a "southern" term. Thanks for noticing, Don! Remember, I am from Arkansas. Thanks, Dufus, I'll add this badge to my blog as soon as I can find it again. 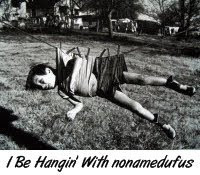 Me-Me: Well your caption had me laughin', which was pretty good as I could hardly breathe. Oh yeah... Margo totally rocked that one. Good job, girlfriend! Way to go, Margo! I guess it's unanimous - drugs and captions go together! Jayne: In the words of a gal with her finger up her nose, she picked a winner! Tgoette: I'm gonna try that approach next week. Margo's caption was definitely laugh out loud funny. Great job! Ziva: I know you can do it! Dude, not that I'm a sore loser or anything (but admit it, "eating the passer" was hilarious), but that Dunlap's Disease line is older than dirt. Chris: There were several "eating" themed captions, one of which made it into the honourable mentions. "Eating the passer" was funny to be sure. But sometimes "older" can be funny too. Look at me, for example...on a good day.